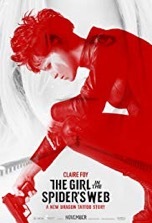 Lisbeth Salander (Claire Foy) is back in The Girl in the Spider’s Web, based on the novel by David Lagercrantz and the characters created by the late Stieg Larsson. An extension of the American franchise (predated by a Swedish trilogy based on Larsson’s Millennium series) that began with David Fincher’s The Girl with the Dragon Tattoo (2011), Spider is directed by Fede Alvarez (Don’t Breathe) and features a largely foreign cast, which lends the film added authenticity. The story begins with computer hacker Salander accepting a job to steal top secret information. Soon after completing the task, Salander becomes the target of several international agencies including: the Swedish police, Russian agents, the NSA and a mysterious figure from her past. What has drawn the interest of such disparate entities? A computer program called Firefall, which can access the codes of every nuclear arsenal on the planet. And it’s up to Salander to make sure the program doesn’t fall into the wrong hands. The stolen files become the movie’s MacGuffin—the various parties are willing to go to any length to secure it, which presupposes an action-oriented plot. And indeed, the movie is packed with full throttle, well-choreographed action sequences that feel like they were lifted right out of a Bourne or Bond film. The motorcycle chase, culminating with Salander hurtling across an icy lake, is one of the most spectacular sequences in the movie. The bathroom brawl, vertical-lift bridge shoot-out and gas mask melee are also finely executed fight scenes. Foy (TVs The Crown) is absolutely spellbinding as misanthropic photo journalist Salander. Whereas Rooney Mara (from Dragon) tried to act anti-social and mad at the world, Foy just is. Though Foy is effective throughout, she’s downright frightening in her initial sequence where she goes vengeful vigilante on a woman beater—the makeup around her eyes gives her an added layer of feral intensity and makes her look like the newest member of the Suicide Squad. Salander’s boss and confidant, Mikael Blomkvist (Sverrir Gudnason), has a far less significant role in this movie and, disappointingly, doesn’t really factor into the story in any meaningful way. And, with apologies to Gudnason, he’s no Daniel Craig. The gorgeous locations, many of which were filmed in and around Stockholm, Sweden, add a great deal to the film and are truly mesmerizing and transporting. The cityscape establishing shots, particularly the ones shot at dawn, dusk or night, are breathtaking. Alvarez and his location scouts found some spectacular places to film, most notably an abandoned observatory. Such a locale is typically used as the villain’s lair, not the hero’s hideout, so kudos to Alvarez for bucking convention. There’s far more backstory for Salander in this film than in Dragon. At the beginning of the movie, we witness a deeply disturbing flashback scene where young Salander leaves her sister alone with their father. The scene gives us the distinct impression that the girls grew up in an incestuous environment. Due to Salander’s traumatic childhood, she distrusts most people, men in particular. Since one of the movie’s main themes is the sexual exploitation of women, Salander is held up as a type of avenging angel (or demon) when she ties up and tortures the man who batters a defenseless woman. On a psychological level, taking revenge on the man is a form of catharsis for Salander; tormenting the perpetrator is like getting back at her father. The film seems to suggest that such heinous deeds are justified and that “an eye for an eye” is a perfectly acceptable method of punishment under the circumstances. It’s ironic that her vicious attack makes Salander just as bad as the abusive man. But such irony is lost on a movie bent on glorifying violence and applauding vigilantism. Sad. Whereas Dragon was a well-constructed mystery; Spider is a high-octane spy film. Though lacking in star power, the story by Alvarez, Jay Basu and Steven Knight is a taut thriller that keeps the audience engaged all the way up to its cliffhanger ending. So, let the debate begin. Is Spider as good as Dragon? Regardless, if you can get past the movie’s objectionable content, this is one yarn you’ll be glad you got tangled up in. They say honesty is the best policy. In that case, I need to be honest from the start…this isn’t my kind of movie. But if I’m being totally honest, I feel like I’ve been the victim of a bait and switch. When I signed up to review this movie, I thought Overlord, the J.J. Abrams produced WWII tale, was going to be a straightforward action movie. Then I saw the trailer and thought, “What in the world have I gotten myself into?” The movie’s premise is straightforward…a group of American soldiers parachute into France on the eve of D-Day. Their objective is simple; sneak into a French village under the cover of darkness and take out the radio tower that sits atop a church building. However, when the American soldiers infiltrate the church, they discover many living and dead people who’ve been mutated by evil alchemy in a makeshift dungeon. To accomplish their mission, the American troops must engage in a series of gun battles with Nazis while evading the fast-moving zombies that lurk in the claustrophobic corridors of the church. From that brief description of the story, you’ve guessed right that Overlord is a mash-up of Saving Private Ryan and I Am Legend. Although the story has some semblance of a plot, the novelty of its premise wears thin around the movie’s midpoint. Writers Billy Ray and Mark L. Smith weave their paltry plot among the tapestry of overblown action sequences and zombie brawls. 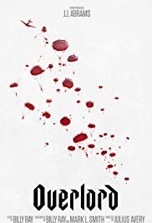 Overlord is directed by Julius Avery, a virtual unknown who has directed only one other feature-length film. The cast is populated with newcomers, bit players, and journeyman character actors with nary a star among the bunch. Other than the intrigue of its story, Abrams’ name is the movie’s only real draw. The movie’s theme is as obvious as its premise: the dangers of playing God. Though taken to unrealistic extremes, you can totally see how Hitler would sanction such a diabolical plan to create super-soldiers. The “1,000 Years of the Reich” program is an interesting concept, but the zombie subplot is flagrant revisionist history and is only in the story to provide thrills and chills for the audience. Overlord has an excessive amount of violence, swearing and disturbing images. Aside from its myriad shoot-outs between Nazis and American forces, the movie also contains a graphic torture scene and two attempted rapes. We catch glimpses of disfigured and mutated humans inside the cells in the church’s basement. The surgery room contains mutilated cadavers and several experiments gone wrong, like a talking woman who has only a head and spinal column (which is much more macabre than the initial image of the bodiless Borg Queen in Star Trek: First Contact). The mutation process, when human subjects are turned into zombies, is quite hideous. Another horrific scene is when corpses (failed experiments) are carted out of the church, dumped into a ditch and incinerated with a flamethrower. Those with a weak stomach have been forewarned. One area of the movie that’s commendable is its production. From the opening CG shot of the Allied fleet to the pyrotechnics and FX, to the costumes and creature makeup, Overlord is a well-crafted movie. It’s to Avery’s credit that he only sparingly resorts to standard horror movie gimmicks, like characters suddenly appearing in front of the camera to startle the audience. In the final analysis, Overlord is a war/horror hybrid that’s unabashedly graphic. From start to finish, the movie is gratuitous for the sake of being gratuitous. Though Overlord is a unique film, it certainly isn’t a great one. 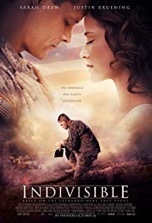 Based on the true story of how Army Chaplain Darren Turner (Justin Bruening) suffered from PTSD after returning home from Iraq in 2008, Indivisible is a well acted and produced film about faith and family. A third of the film takes place in Iraq (filmed in Santa Clarita, CA—M*A*S*H country) and another third in Memphis, Tennessee. During these scenes, the story effectively shifts its focus between the battlefront and the home front. Not only does the parallel action keep the movie rolling along, it also serves as the structure and core of the film. The final third of the movie focuses on the events before and after Darren’s tour of duty. Instead of fanfare and bliss, Darren returns home to a marriage on the brink. Darren’s wife, Heather (Sarah Drew), is deeply distressed by his withdrawal from her and the kids. Darren and Heather are a proxy for many other couples who’ve struggled to readjust to “normal” family life after a spouse returns home from active duty. The most poignant scene in the movie is when Darren tells Heather she has no idea how horrible it was in Iraq and Heather tells Darren he has no idea how difficult it was to raise kids all by herself while consoling many other soldier’s wives. The scene contains superb acting and is infused with raw emotion. It’s a shame the rest of the movie wasn’t as riveting or dramatic. Despite the finest allocation of its limited budget, Indivisible comes off as an inspirational movie of the week rather than a major theatrical release. Though the movie flirts with meaning, many scenes are oversimplified, predictable and borderline schmaltzy, which is a shame since the serious nature of the story demanded more from it. Still, it’s clear that everyone involved in the production was dedicated to the story and its message. Bruening and Drew, who both appeared on TV’s Grey’s Anatomy, have excellent screen chemistry and do a fine job portraying their characters. The movie boasts some fine guest performers as well, including Michael O’Neill as Chaplain Rogers and Eric Close as Lieutenant Colonel Jacobsen. In the end, Indivisible is too conservative for its own good—director David G. Evans could’ve portrayed the effects of PTSD in a more compelling and serious manner while retaining the movie’s family friendly, faith affirming themes and values. Unfortunately, what we’re left with is heartfelt but Hallmarky.